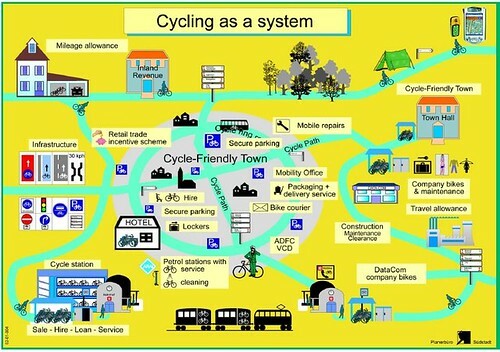 Drawing, Bicycle Traffic as a system, German National Bicycle Plan, 2002-2012. At the National Bike Summit yesterday, one of the opening sessions was a forum on women and cycling. While everyone on the panel--including DC's own Veronica Davis, a Ward 7 activist, civil engineer, and entrepreneur, and founder of Black Women Bike DC, and Nelle Pierson, Events Coordinator of the Washington Area Bicyclists Association--made many important, insightful points, the presentations were not at the level of generating meta-theory. Ironically, in the Q&A, a "man" made the point that I wanted to spout off as well, that the real issue with biking, for women, people of color, families, children, etc., has to do with the fact that biking as transportation is not taken seriously, generally, in the United States. Not by manufacturers, not by retail stores (mostly), not by traffic engineers, not by most elected officials. And it doesn't help the bicycling "community" is so bifurcated between the weekend riders and the daily transportation riders. The respondent emphasized his point by comparing US bike shops to those in Northern Europe, and how US shops are full of racing bikes--that's where the money is after all--while in Northern Europe, bike shops sell what we might call practical bikes. I have a presentation where I make the point that automobile driving is supported by a system of "wraparound" services--besides roads with signs--there are maps and mapping systems, gas stations, repair places, sales outlets (car dealerships), places to park, including parking structures, restaurants, and motel/hotel accommodations, among other services, to support people at various points on their journeys, either locally or for farther distances. For bicycling as transportation to be as convenient, practical, and a fundamental transportation mode--in the Netherlands 35% of all trips are made on bike and the demographic split between female and male bikers is 55%/45% respectively (in the US, at best the split is 33%/64%)--we need a comparable system. In the intermediate term, to me, it means focusing biking as transportation in those places where biking is practical, convenient, and efficient--competitive with other modes. I sat next to a person who is a bike advocate in Metro Atlanta. She bikes 7 miles to work, in an area with minimal support infrastructure. She got herself designated the employee transportation coordinator for her worksite. On her own she found the Whatcom County (they have a transportation demand management program that's even better than Arlington County's) and a link to the Washington State Employee Transportation Coordinator manual... while there are just a handful of bike commuters now, the company understands that the more people that drive to work, the more parking structures they have to build, and they don't want to have to do that. But as we discussed, it's a lot different when there are mandates/requirements for motor vehicle trip reduction. And so it goes.